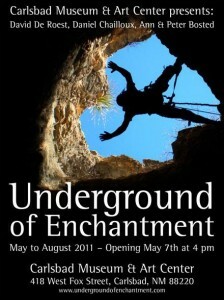 On May 7th Underground of Enchantment will be opening at the Carlsbad Museum and Art Center. The 3D photo exhibit of Lechuguilla Cave in southeastern New Mexico will feature the works of David De Roest, Michel Renda, Daniel Chailloux, Peter & Ann Bosted talented cavers/photographers who hail from Belgium, France & the United States. The exhibit runs until August 2011 at the Carlsbad Museum and Art Center, afterward it heads to the The Western Heritage Museum in New Mexico from September to October. From to August 2012, it will be shown at Carlsbad Caverns National Park itself. For more information head on over to the official Underground of Enchantment website.